A perfect location for anyone looking to park large vehicles, truckers, hobbyists who need 2 large buildings with a small heated workshop for year round access, situated off a highway for easy access in all weather conditions. This 1.77 acre lot allows for HOME OCCUPATION use – it is not zoned Commercial – but under the present zoning designation there are many things one can do here. Both outbuildings are steel exterior – the larger one built in 2009 is 60 ft. x 36 ft has a gravel floor, hydro and 2 – 10 foot overhead doors. The second steel building is 48ft. x 28ft approx. and has a heated workshop inside it with concrete floors and measures 28 feet x 16 feet for the workshop area. That also has an overhead door and a man door. 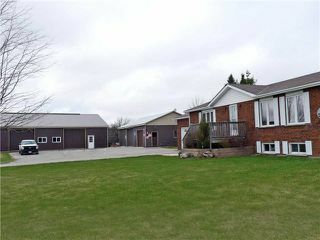 The raised bungalow is a Quality built home, approximately 1200 sq. ft on the main level and the same (unfinished) in the basement. Beautiful hardwood floor in the spacious living room with a huge picture window looking west. The kitchen/dining area is open to each other and has a walkout to a covered deck for summer dining. There is an attached garage for one car making unloading groceries in winter an easier job. The lot is open with no neighbours close by – so there is a good degree of privacy.